1 RULES The regatta will be governed by the ‘rules’ as defined in The Racing Rules of Sailing. 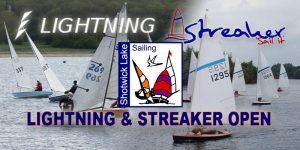 2 NOTICES TO COMPETITORS Notices to competitors will be posted on the official notice board located at Shotwick Lake SC Clubhouse. 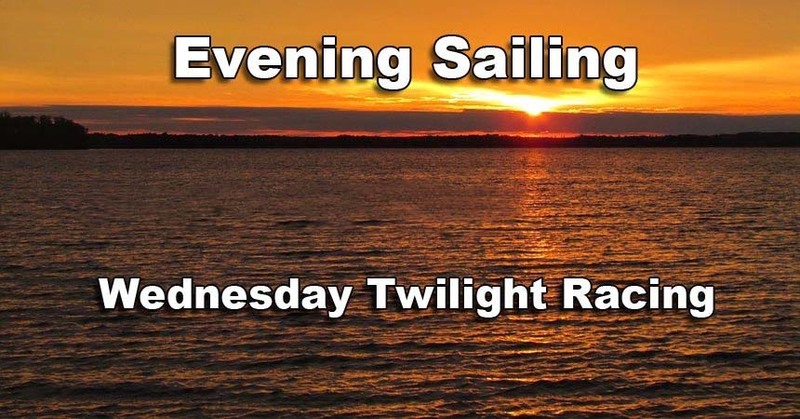 3 CHANGES TO SAILING INSTRUCTIONS Any change to the sailing instructions will be posted before 10:00 on the day it will take effect, except that any change to the schedule of races will be posted by 20:00 on the day before it will take effect. 4 SIGNALS MADE ASHORE Signals made ashore will be displayed at the Starting trolley . 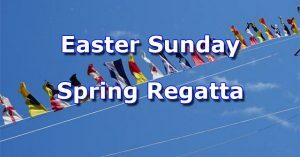 Sunday Club Racing: First Race will start at 10:30am. The number of races will be as on the Sailing Programme and/or Club Calendar. 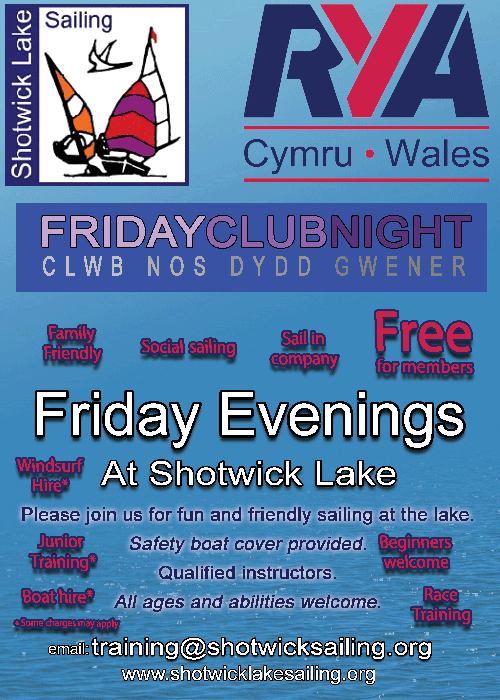 Open meetings and club regattas: First Race will be as advertised and shown on the Club Calendar. 6 CLASS FLAGS No Class flags will be used. The warning signal will be indicated by the H flag. 7 THE COURSES Courses will be displayed on the course board in the clubhouse no later than 20 minutes before the start of that race. 8 THE START 8.1 Races will be started by using rule 26 with the warning signal given 5 minutes before the starting signal. 8.2 Rule 30.1 will apply regardless of the I flag being flown or not. 8.3 The starting line will be as depicted on the race course board. 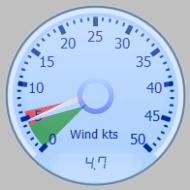 8.4 The start may be split into fleet starts at the discretion of the Race Officer and the warning signal of the slower fleet will be made 1 minute after the start of the faster fleet. 8.5 Boats whose warning signal has not been made shall avoid the starting area. 9 THE FINISH The finishing line will be as depicted on the race course board . 10.1 Protest forms are available at the race office. Protests shall be delivered there within the protest time limit. 10.2 For each class, the protest time limit is 30 minutes after the last boat has finished the last race of the day. [The same protest time limit applies to all protests by the race committee and [protest committee] and to requests for redress. This changes rules 61.3 and 62.2.] 10.3 Notices will be posted within 30 minutes of the protest time limit to inform competitors of hearings in which they are parties or named as witnesses. Hearings will be held in the jury office at a time that will be announced. 10.4 Notices of protests by the race committee or [protest committee] will be posted to inform boats under rule 61.1(b). 11 SCORING 11.1 The Low Point scoring system of Appendix A will apply. 11.2 Half +1 races of those sailed in a series are required to be completed to constitute qualification to a series. 12 SAFETY REGULATIONS 12.1 Boats should sign on for each race except during an Open meeting or club regatta at which there entry suffices for the event. 12.2 A boat that retires from a race shall notify the race committee as soon as possible. 13 REPLACEMENT OF CREW OR EQUIPMENT Substitution of competitors will not be allowed without prior approval of the race officer. 14 OUTSIDE HELP A competitor shall not be penalised for accepting assistance from the Safety Boat in righting their capsized boat or recovery from a lee shore. This changes Rule 41. 15 EQUIPMENT AND MEASUREMENT CHECKS A boat or equipment may be inspected at any time for compliance with the class rules and sailing instructions. 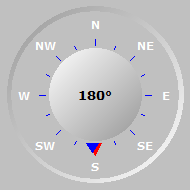 On the water, a boat can be instructed by a race committee measurer to proceed immediately to a designated area for inspection. 16 RADIO COMMUNICATION A boat shall neither make radio transmissions while racing nor receive radio communications not available to all boats. This restriction also applies to mobile telephones. 17 DISCLAIMER OF LIABILITY Competitors participate in the regatta entirely at their own risk. See rule 4, Decision to Race. The organizing authority will not accept any liability for material damage or personal injury or death sustained in conjunction with or prior to, during, or after the regatta. 18 INSURANCE Each participating boat shall be insured with valid third-party liability insurance with a minimum cover of £2,000,000.